The PowerPoint 2016 printing features are useful, but PowerPoint is really designed to create slides that are presented directly on a screen rather than printed out. The screen can be your computer’s own monitor, a projector, or an external monitor, such as a giant-screen television. In most cases, the default settings for showing a presentation are adequate. However, in some cases, you may need to change the default settings. To do so, first open the presentation that you want to set up and then open the Slide Show tab on the Ribbon and click Set Up Slide Show (found in the Set Up group). This action summons the Set Up Show dialog box, which is shown here. With this dialog box, you can twiddle with the various options that are available for presenting slide shows. The Set Up Show dialog box. Configure the presentation: You can configure the presentation for one of three basic slide show types: Presented by a Speaker (Full Screen), Browsed by an Individual (Window), or Browsed at a Kiosk (Full Screen). Loop through slides: Select the Loop Continuously until ‘Esc’ check box if you want the show to run indefinitely. If you enable this setting, the show jumps back to the first slide after the last slide is shown, and the show continues to repeat until you press Esc. Simplify the presentation: Deselect the Show Without Narration and Show Without Animation options if you want to simplify the presentation by not playing narrations that you’ve recorded or animations that you’ve created. Disable hardware graphics acceleration: Use this option only if your computer is having trouble properly displaying the graphics, media, or animations in your presentation. Select pen and laser pointer color: Select the color to use for the pen or laser pointer. Select slides: In the Show Slides area, select All to include all slides in the slide show or choose From and supply starting and ending slide numbers if you want to display just some of the slides in the presentation. 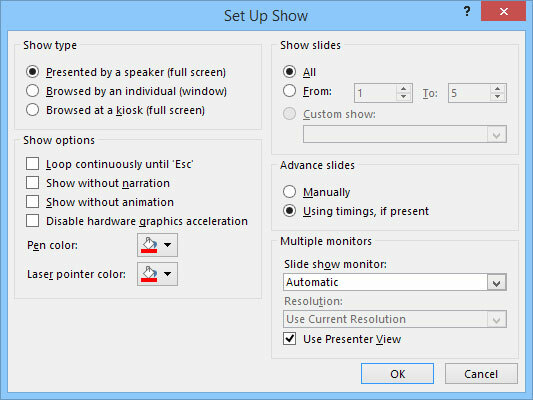 Set up custom shows: Choose Custom Show if you have set up any custom shows within your presentation. Choose to change slides manually: In the Advance Slides area, choose Manually to advance from slide to slide by pressing Enter, pressing the spacebar, or clicking. Or, if you want the show to proceed automatically, select the Using Timings, If Present option if it’s available. Select a monitor: If your computer has two monitors, select the monitor to use for the slide show by using the drop-down list in the Multiple Monitors area.